Our world is one hopping place, and for all the talk about slowing down to savor meals together, the snack food, street food, food trucks, and take-away joints are proof that we’re not really listening. We’re on the move. Our food will just have to keep up. There’s nothing modern about food with legs. The moment early pastoralists learned to string bits of lamb on a spit, grill it over live coals, and hastily hit the trail again, a culinary technique for the ages was born. Today the kebab remains one of the most popular and versatile foods the world has ever known. It makes a cameo appearance in many cuisines, but for a sizable chunk of the world’s population, it’s a marker of cultural identity. With a resume like this, it’s not surprising that kebabs come in a variety of forms. Pick up the menu at Somerville’s hole-in-the-wall Istanbul’lu, for example, and you will see that for Turks, kebab can be a meaty stew as well as grilled meat on a spit. Almost every culture in which the kebab is esteemed makes a distinction between solid chunks of marinated meat and preparations that involve minced, spiced meat. In Turkey, grilled meats are likely to be identified as sis (pronounced sheesh), and minced as kofte. Beyond this, you will notice some subtle and not-so-subtle differences, depending on whether your kebab is made according to Persian, Middle Eastern, Balkan, or North African tradition, all lands subject to first Arab and later Ottoman rule, or strongly influenced by these cultures. It’s a bonus that in the Boston area, the empire of the kebab has never been conquered by national chains and remains overwhelmingly the domain of small, family restaurants. 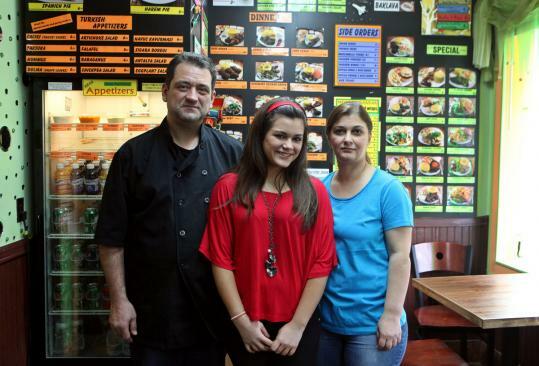 At Shiraz Persian Cuisine in Watertown, chunky meat kebabs are called barg, the minced version kubideh. The Persian approach to rice is distinctively refined (there is a staggering number of recipes for preparing it); the process can involve both boiling and steaming, and, often, adding a saffron-hued drizzle on top. The grains, usually basmati, are dry, separate, and tender. Salad is a more common accompaniment to Greek kebabs (sometimes called souvlaki) and North African versions; you are also less likely to encounter minced, spiced skewers, except in the form of the vertical-spit-roasted gyro (pronounced YEAR-o), a.k.a. shawarma and doner kebab, tucked with vegetables and a sauce into a folded circle of flatbread. Your kebab may come on its skewer or deconstructed on a bed of rice or salad. Vegetables like tomatoes and moderately hot green peppers are commonly grilled separately, although onion and pepper slices frequently alternate with meat on Greek kebabs. Lamb may be the most orthodox basis of a kebab, but beef and chicken are common here, too. Think of the kebab as a kind of nomad. It picked up influences wherever it went and it’s still on the move - with no intention of slowing down. Stephen Meuse can be reached at bytheglass@globe.com.